Joining the show during the second hour are the father and son co-authors of Counter Mentor Leadership: How to Unlock the Potential of the 4-Generation Workplace. Millennials now make up the largest percentage of the workforce. Their confidence and technological expertise have radically changed office dynamics. But with Boomers craving the comfort of a hierarchical organization and Millennials demanding inclusion and collaboration, the clash of perspectives often impacts the bottom line. Strategies that move managers from being simply directors to becoming “people developers” — coaches, motivators and listeners — will provide the collaborative culture Millennials crave. 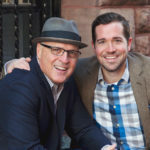 Father and son team Kelly Riggs, a Boomer, and Robby Riggs, a Millennial, the co-authors of Counter Mentor Leadership: How to Unlock the Potential of the 4-Generation Workplace, are entrepreneurs and management consultants. Together they are uniquely positioned to challenge stereotypes and poke fun at the status quo. What happens to the bottom line in organizations plagued with turnover from malcontent Millennials? How to transform an entrenched generational disconnect into a dynamic, collaborative organization able to face 21st century challenges. How to move from directives and demands to relational leadership. How to capitalize on each generation’s skills to close the knowledge gap and enhance understanding. Kelly Riggs is an author, speaker and business performance coach for executives and companies throughout the U.S. and Canada. Kelly is a former sales executive and two-time national Salesperson of the Year with well over two decades of executive management and training experience. Robby Riggs is a corporate consultant specializing in strategic transformation initiatives and driving successful change in companies ranging from start-ups to Fortune 100s. Their new book, Counter Mentor Leadership: How to Unlock the Potential of the 4-Generation Workplace (Nicholas Brealey Publishing, 2018), offers practical, actionable advice that improves workplace culture and enables organizations to bridge the generational divide. For more information, visit www.countermentors.com. Former leading Wall Street consultant Robert Levey joins the show in the third hour to discuss his book, Risk: A Tale of Wall Street. The financial crisis of 2008 was the worst economic disaster since the Great Depression of 1929. During the subsequent Great Recession housing prices fell 31.8 percent and, even 2 years after the recession ended, unemployment was still above 9 percent. The financial crisis of 2008 changed the course of history. Unfortunately, as most know, history repeats. So now, here in early 2018, as the DOW continues to set new record closing highs, are we on the brink of another financial disaster? After 30 years as a leading Wall Street trading consultant (Merill Lynch, Solomon Brothers, Citibank, Chase), Robert Levey brings his unique perspective on those who make the stock market tick through his engaging novel, Risk: A Tale of Wall Street. Levey’s book documents the sweeping epic of financial madness and greed in a game played with infinitely high stakes from the perspective of a young woman turned international powerhouse. Kirkus Reviews calls Risk “a thoughtful and well-crafted look at the human stakes in high finance.” Levey’s book reveals how everything written about the recent mortgage crisis is about what did happen, but this is the story of what could happen. From Wall Street to Paris and beyond, Risk is a sweeping epic of financial madness and greed in a game played with infinitely high stakes. More than a by-the-numbers exposé, it deals in lively detail with those who risk their careers, their treasure, and sometimes their very lives on the decisions they make. As an insider on Wall Street for 30 years, Robert Levey brings his unique perspective on the thoughts and actions of the market makers. For more information, visit http://www.robertlevey.com.